At Cavallino, you can order a hot chip pizza. You heard us. A cheese and tomato pizza, covered with a huge nest of hot chips. It’s better than French fries dipped in a chocolate sundae or a sausage roll wrapped in bread. “Where the hell do I get me one of those?” you’ll be saying right about now. You’ll need to take yourself to Terrey Hills, on the northern outskirts of Sydney. It’s a trek if you live south of Chatswood, but it’s well worth it. The people behind Cavallino are Giovanni Pilu and Marilyn Annecchini from Pilu at Freshwater and Lido Russo from Ventuno. It’s a restaurant that every suburb should have – a place you can go for a pizza, or a bowl of pasta, or even just some antipasto and a glass of wine. It’s not crazy expensive, and you’ll get more value for your money than you would in any Leichhardt red sauce joint simply for the fact they employ good chefs and have created a thoughtful, elegant menu. It’s not specifically Sardinian like Pilu at Freshwater, though they do offer a bottarga pizza. (Don’t know what bottarga is? It’s dried mullet roe – here, shaved on top of a tomato and cheese pizza – and is to Sardinia what balsamic is to Modena or Chianti is to er, Chianti.) Nor is it Tuscan, even though they’re offering the likes of chicken liver pâté, Tuscan style, served with slices of bread moistened with broth. The pâté is dark, coarse and rich while remaining light and slightly sweet. There are raw slices of kingfish dressed with olive oil, capers, fine slices of green olive and mint – scoop it all up with pieces of Sardinian flat bread, which are called carta di musica because they’re as thin as the paper you write music on. This flatbread is also favoured because it never goes off, so you can take it on long hikes or out while you’re tending the sheep. As you do. 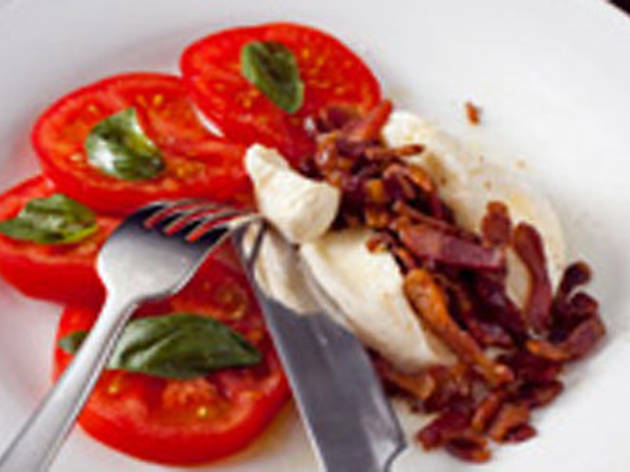 Of all the dishes here, though, it’s the burrata you should order. 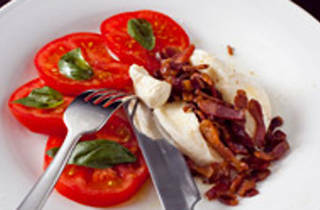 This cheese – like a much softer, creamier buffalo mozzarella – is now being produced in Australia. (Previously, you could only get it air freighted from Italy. Take that, food miles.) The firm exterior looks like a little white silk bag with a knot in it. Inside, it’s a delicious, oozing river of yum. A little pile of crisp-fried pancetta sits on the side. Pierce open the cheese knot and sprinkle in the little cured pork bits – the mix of fat, salt, crunch and squish is dynamite. Order two of these if there are more than three people at your table. Their pasta is worth the trip alone. Pan- fried potato gnocchi, say, with duck ragù, or firm ribbons of pappardelle with rabbit and mushroom ragù. And the kids’ menu looks unreal: penne with butter and parmesan or the Margherita pizza with chips (like the adult version, only pint sized).